He firmly subjugated the areas previously under only nominal Assyrian vassalage, conquering and deporting troublesome Aramean following a battle at the junction of the Khabur and Euphrates in 910 BCE. After subduing Neo-Hittite and Hurrian populations in the north to far-off places. Adad-nirari II then twice attacked and defeated Shamash-mudammiq of Babylonia, annexing a large area of land north of the Diyala River and the towns of Hīt and Zanqu in mid Mesopotamia in the same year. He made further gains over Babylonia under Nabu-shuma-ukin I later in his reign. He also campaigned to the west, subjugating the Aramean cities of Kadmuh and Nisibin. Along with vast amounts of treasure collected, he also secured the Kabur river region. 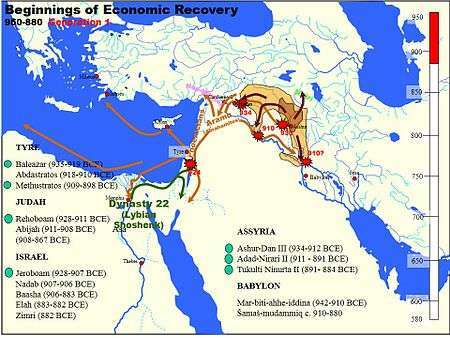 His reign was a period of returning prosperity to the Middle East region following expansion of Phoenician and Aramaean trade routes, linking Anatolia, Egypt under the Libyan 22nd Dynasty, Mesopotamia and the Mediterranean. Adad-nirari II's son was named Tukulti-Ninurta II and Tukulti continued to wage war against Assyrian enemies. 1 2 Healy, Mark (1991). The Ancient Assyrians. New York: Osprey. p. 6.